I was intrigued when I saw this recipe, Lotus Root Cake recipe by Amy Beh in the Star not too long ago. Cake with lotus root ...... I'm not going to give this a miss! This recipe comes in very handy, especially now that Chinese New Year is barely 3 weeks away. Also, 'Lotus Root' which sounds like 'Lin Yau' in Cantonese is very propitious ..... literally meaning 'you have abundance'. So, I take this opportunity to wish all my friends and readers 'Lin, Lin Yau Yue' ..... 'Yue' here sounds like 'excess', hence 'May you all have bountiful abundance each and every year'! 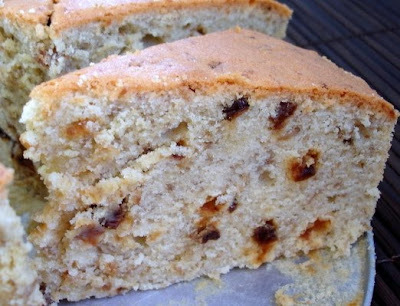 This cake is moist, light, not too sweet as I've reduced the sugar and it's absolutely yummy. 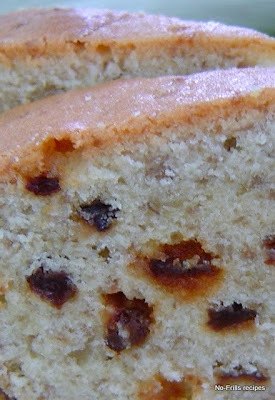 At first glance one would think that this is a banana cake with raisins, you can never dream that it's lotus root! Do give this a try ......... A veggie cake, full of nutrition, you won't regret it, it's truly delicious ! Chop up the sultanas and lightly coat with some flour from the above 285 gm. Lightly flour and grease an 8 inch square or round tin. Set aside. Grate the young lotus root and gently squeeze out liquid. Do not squeeze completely dry, but moist enough. Sift the flour with the baking powder and salt. Set aside. Cream butter with sugar till light, creamy, thick and fluffy. Beat in egg yolks one at a time, mix well. Add in vanilla and grated lotus root till well combined. In another bowl, beat egg whites till stiff but not dry. Fold the egg whites into the lotus root mixture. Mix thoroughly, scraping from the sides and bottom of the mixing bowl. Finally add in the chopped and floured sultanas. Pour batter into prepared tin, bake in preheated oven @ 180 deg C for about 70 mins. or till skewer inserted comes out clean. Allow cake to cool in tin for about 10 mins. before turning out to cool on wire rack. wow interesting recipe. Looks really moist! I've never seen lotus root in cakes before. reminds me of carrot cake. How creative! The cake looks moist and beautiful. Sounds interesting. Looks wonderful! I like lotus root in my stirfry, and salads. I would love to try this, and I like that it's not too sweet. I haven't tried a lotus root cake and it sounds very interesting. Lotus root are hard to find though. But I want to give this cake a try one day. Yes, it does resemble carrot cake somewhat. This is rather unusual, using lotus root. Yes, it's not too sweet because I've reduced the sugar. Yes, you should try it when you encounter fresh, young lotus root! yum! that cake looks wonderful! Hi, I just discover your blog. the lotus root cake is very interesting. Would like to try making it sometime, hope you don't mind that I borrow your recipe. Thanks. By the way I've read your green tea cake recipes too, just to let you know that you have to use matcha powder for cake and dessert making to have the nice green colour effect. Other green tea use will only turn brownish green. Hope you don't mind, anyway thanks for sharing all those wonderful recipes. Thanks for dropping by. Of course you are welcome to try the Lotus root cake. Do let me know the outcome after you've made it. As for the green tea powder, this is what I can get from my normal baking ingredients supply outlet. They assured that it's Japanese green tea powder for baking and dessert. Perhaps I should try to put more the next time. Will need to try out another recipe when I have the time. Hmm...never knew that Lotus Root can be used in this manner. Looks yummy!